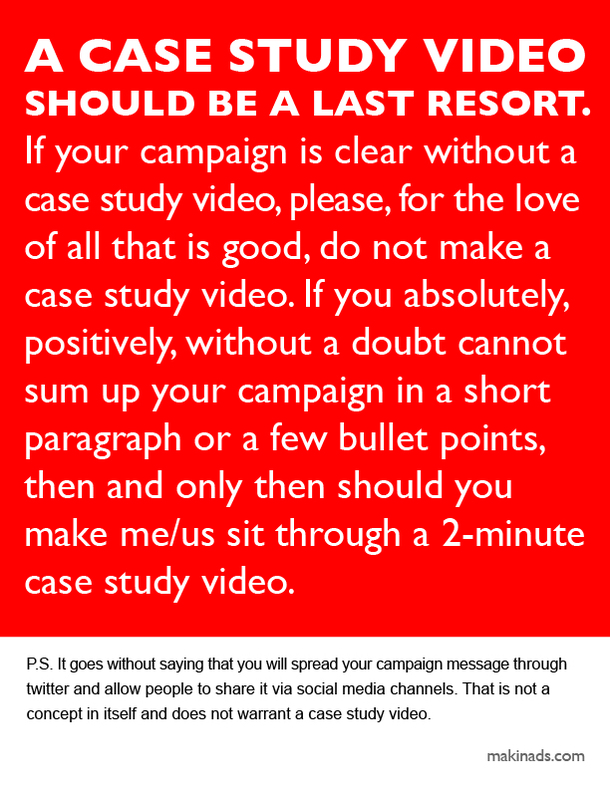 If your campaign is clear without a case study video, please, for the love of all that is good, do not make a case study video. If you absolutely, positively, without a doubt cannot sum up your campaign in a short paragraph or a few bullet points, then and only then should you make me/us sit through a 2-minute case study video. P.S. It goes without saying that you will spread your campaign message through twitter and allow people to share it via social media channels. That is not a concept in itself and does not warrant a case study video. P.P.S. We have made this post into a handy jpg. Please feel free to blow it up, print it out and post it at your school/agency/barn. Godspeed. c) If it fits, great. But it’s not mandatory. No matter the medium, if you can use fewer words to convey the same meaning, do it. Greg has written before about the importance of having a great elevator pitch. Here’s another way of looking at it. This is something I picked up on after attending the Creative Week panel The Idea Matters… Still. Boy’s parents murdered, so he starts wearing a cape, fighting crime and talking in a deep, gravelly voice (Batman). New York cop single-handedly stops terrorists from robbing an office building, all before the helpful proliferation of cell phones (Die Hard). Nerd steals website idea from good-looking jocks and becomes an awkward billionaire (Social Network). Your best ideas should be this simple and accessible. Try this test: take one of your ideas, write it down in a short sentence on a blank piece of paper. No visuals, no technology, no strategy, just an organized jumble of letters. Does it still seem like a big idea? Does it pop? Does it wow? Do you look at that sentence, want to fold it in three and overnight ship it to Gerry Graf, Jeff Goodby and Dan Wieden? Or, without all the glitter, does it seem empty, boring, unspectacular, less than large? If, sans glitter, it’s not ready for the limelight, then figure out what it needs. Is it too complicated or gimmicky? Is it just a tactic? Is there something missing or is there something there that doesn’t have to be? Boiling your idea down to a single, naked sentence can separate the great ideas from the good ones. Because all the glitter we sprinkle on our ideas makes them look better than they really are. We’re storytellers, after all, and part of telling a story is making an idea seem bigger and better than it is on its own. When we present, there’s always more than the idea. There’s backstory and visuals. A beautiful presentation. 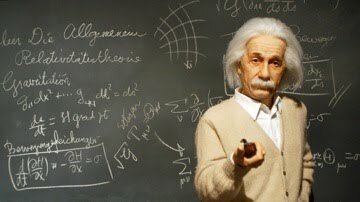 People with varied areas of expertise go into an exorbitant amount of detail about each carefully-thought-out step of the process. 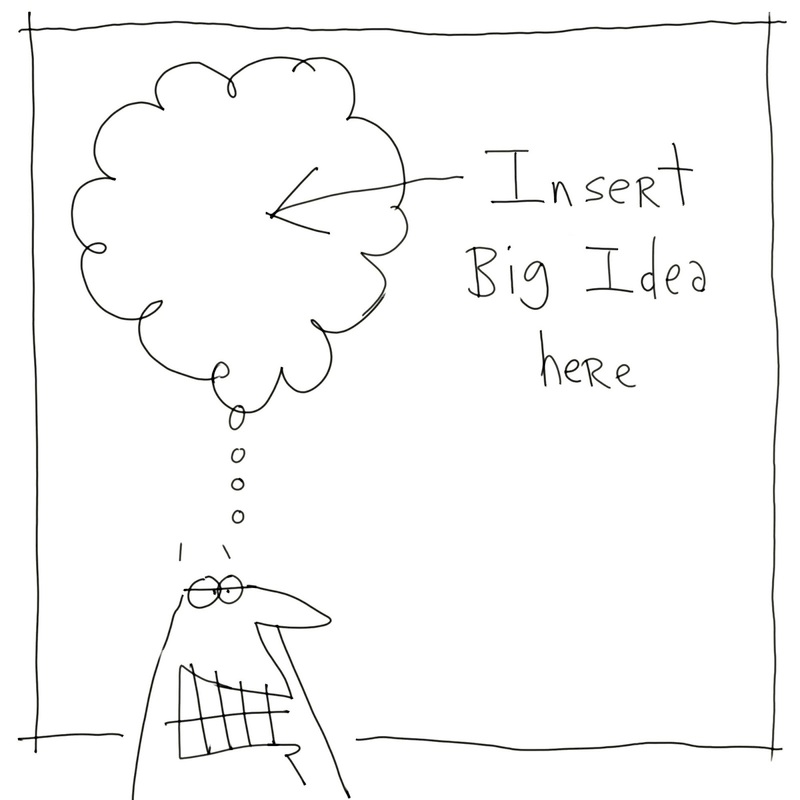 Then, once sufficiently built up, the big idea is revealed with reserved aplomb. But if you start with a less-than-great idea, the final product will always have something missing. So before you put all that effort into presenting and selling your idea, write it down in one single thought and stare at it. If it still seems like the best idea you’ve ever seen, you’ve got a winner. Just imagine how great it will be once you add all the glitter. I wrote a post on my other blog over the weekend about the Occupy Wall Street’s lack of clear messaging and how they might improve it by asking themselves the questions we ask ourselves each time we’re trying to sell something. Greg asked me to post it here. Here’s a link to it: The Message has an Occupy Wall Street Problem. Here’s a short piece that has great copy and great art direction. Simple message. Simple images. Simple brand positioning. So clear and deliberate, you either hate the guy’s guts, or you sign on as a lifelong follower. No wonder this show won Best Picture. Caveat: Before you decide to “pay homage” to this by ripping it off, you should know Nike and Dennis Hopper already did. Luke Sullivan from Mediastash.tv on Vimeo.